safe and reliable performance for optimal storage. Microprocessor controller with 4x20 character LCD digital display control panel with message center. Hi/Low product temperature alarms, audible and visual. Air probe with air temperature Hi/Low alarms. Remote alarm contacts. Temperature chart recorder and chart paper. 2 levels of user password protection (set points and parameters). 100 event alarm logging including date/time stamp and product temperatures stored in nonvolatile flash memory. Door ajar alarm with adjustable delay time period, power failure alarm. 2 to 10 volt DC output for product temperature (selectable to air temperature). Digital calibration air and product. Real time clock with date and time display. Door opening counter with 24 hour automatic reset. Low battery test switch with buzzer. Condenser/compressor run time monitor, fan motor run time monitor, defrost heater time monitor. Exterior cabinet front, sides and back painted white, exterior cabinet top and interior door panel are galvanized steel. Interior cabinet liner and interior door panel are painted white. Heavy duty door pivot hinges, centered key door lock (2 keys), full length door pull handle. 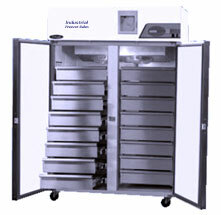 8 solid pull out stainless steel drawers per door. Perimeter anti-condensate door frame (temperature selectable), heater wires. Automatic defrost and condensate evaporation. For download, choose from PDF files at right.